As the paddock rolled in to Le Mans so did the rain clouds, with the showers really playing havoc with Moto3’s grid. Moto2 didn’t quite manage to miss the rain either with a late drizzle stopping play. Fabio Quartararo takes his first pole at his home round as he went quickest on the only real lap of qualifying in Moto3 just before the track got slippery causing the French rookie and many others to crash. The session was a disaster for the Leopard Racing team – including championship leader Danny Kent in 31st. Sam Lowes looked to have the pole pace in Moto2 setting a new lap record as the rain returned, only to have Alex Rins knuckle down after the shower to set exactly the same time. The rookie was awarded pole as his fast laps previously gave him the second fastest lap. Moto3’s qualifying session consisted of an outlap a ‘fast’ lap and not much else as a downpour at Le Mans meant if you hadn’t banked a good lap time you were not going to get another chance. Even those with a lap in the bag had trouble as pole man Quartararo’s Honda lost grip and flew into the gravel. He was followed almost immediately by his team-mate Jorge Navarro. It was those opening minutes that counted though with the pair occupying the first two places on the grid for Estrella Galicia 0,0. They are joined on the front row by Mahindra rider Francesco Bagnaia in third, his first and Mahindra’s first front row appearance this season. Jakub Kornfeil, the best qualifying KTM rider, starts fourth for Drive M7 SIC, while Romano Fenati found the rain saved him from himself in an elevated fifth for the Sky Racing Team VR46 outfit. Fresh from his best ever race result in Jerez, Jules Danilo finds himself on row two in sixth for Ongetta-Rivacold. Danilo’s team-mate Nicollo Antonelli is one slot behind in seventh. Miguel Oliveira (Red Bull KTM Ajo) in eighth, Isaac Vinales (Husqvarna Factory Laglisse) in ninth and Tetsuki Suzuki (CIP) with a career best grid position complete the top ten. Juanfran Guevara, riding with a broken collarbone starts 15th, Karel Hanika starts from pitlane after causing the incident in Jerez. British rider John McPhee starts 19thfor Saxoprint-RTG. The Leopard team plan to wait for clear track backfired hugely with Efren Vazquez 29th, Danny Kent 31st and Hiroki Ono 32nd. With the lap record falling early in the session and then being chipped away at as the clock ticked down, it initially looked to be Sam Lowes that was destined for pole – on top as the rain returned. This time it was just a brief shower and Alex Rins set about working his way to the front row for Paginas Amarillas HP 40. After a couple of attempts in traffic the rookie hit the top of the timesheets but posted exactly the same time as the Speed Up rider. Rins was awarded the position for having a second faster lap. Championship leader Johann Zarco was keen to emulate Rins after seeing what he could do after the rain and moved up to third on his final attempt for Ajo Motorsport ahead of his home Grand Prix. Tito Rabat had been lapping consistently all weekend for EG 0,0 Marc VDS but was pushed down to fourth, Taka Nakagami returned to form for the Idemitsu team to take fifth ahead of the ever improving Tom Luthi in sixth for Derendinger Racing Interwetten. 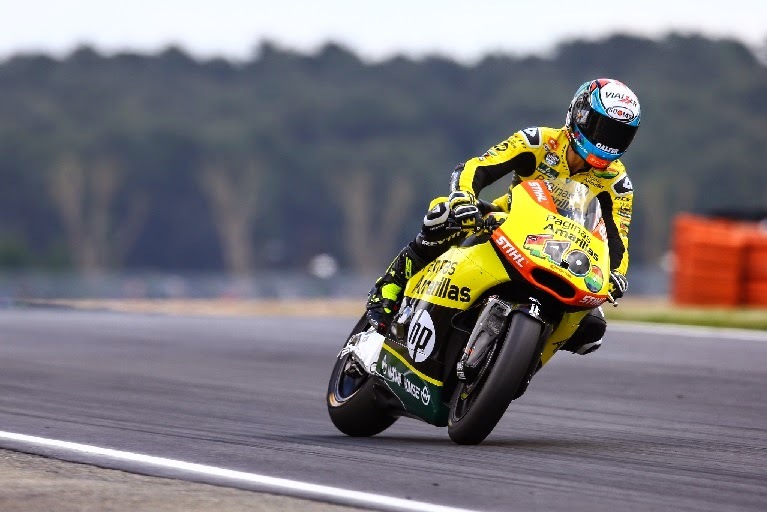 Luis Salom starts his 100thGP from seventh for Paginas Amarillas HP 40 ahead of Xavier Simeon (Gresini) and Julian Simon (QMMF) in eight and ninth to complete row three, with Randy Krummenacher also making the top ten for JiR. Previous Previous post: WSBK: Rea Races To Double Delight in Italy. Next Next post: Moto3 and Moto2 races: Le Mans – Fenati sneaks late win as Luthi leads with ease.